Achieving greater data integrity, governance, and compliance in financial services. Pepper Group is a global financial services organisation with expertise in the residential and commercial property sectors as well as in consumer, auto and equipment finance. This breadth presents a unique set of data management challenges, including increasingly complex data silos. Data integrity, governance and compliance are at the forefront of Pepper’s strategic priorities, but it needed a data architecture with the flexibility and scalability to support its ambitions. Rationalise three Data Warehouses into a single Data Vault while minimising re-engineering costs. Deliver projects faster with fewer defects through automated code generation. Significantly lower the cost of ownership. Data Vault 2.0 inventor, Dan Linstedt, explains why traditional Data Warehouses aren’t built for Big Data. - Steven Mellare, Head of Information Management, Pepper Group. 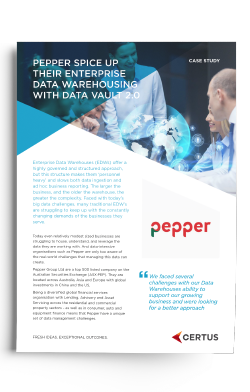 Learn how Data Vault 2.0 keeps Pepper Group ahead of changing business demands.